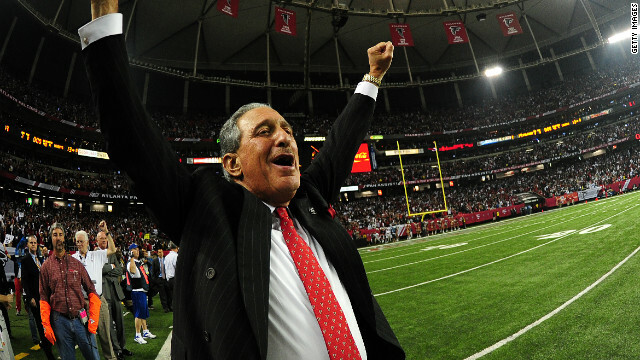 Owner Arthur Blank of the Atlanta Falcons celebrates after the game against the Dallas Cowboys at the Georgia Dome on November 4, 2012 in Atlanta. (CNN) – After three years of talks, the blueprint for a new stadium for the Atlanta Falcons has been finalized and the deal now goes to the legislature for approval. But the way that stadium may get paid for uses a model that some say isn't the best deal for local governments. Under the proposed Atlanta stadium deal, an existing hotel/motel tax will pay for a third of the billion dollar price tag of the facility. But residents aren’t too happy about replacing the 20-year-old Georgia Dome. Sixty-seven percent of metro Atlantans disapprove of hotel/motel tax money for the stadium, according to a poll commissioned by the Atlanta Journal Constitution over the summer. Atlanta is just the latest city to be caught up in a battle that many teams are fighting over their field instead of on it. "The biggest news that people really need to understand is that these stadium and arena deals are really an excuse to extort the money from the public and put that in private pocket,” says Neil deMause, co-author of the book Field of Schemes: How the Great Stadium Swindle Turns Public Money into Private Profit. Nine new NFL stadiums have been built in the last decade, and 6 of those have been rewarded with a Super Bowl. Ben Flowers, an associate professor of architecture at Georgia Tech and a stadium expert, says a new venue can double the value of an NFL franchise, but often leaves taxpayers on the losing end. Why should I have to contribute to the building a stadium that i don't have any stake in? Where's my return as an investor? How about the NFL owner work out loan-based financing between the NFL and the local government? After all, as the owner of an NFL team, you should be taking the risk of whether the stadium makes money in order to get the reward. After all, a portion of every dollar goes to the NFL and the team, right? Why doesn't the owner make a deal with the local government to take loans, and then pay an automatic percentage of all ticket sales plus concessions to the local government, and the owner is responsible for a making a minimum payment per month. In the non-football months, they have to find ways to keep the stadium making money. Oh wait, that sounds an awful lot like taking a risk, buying a piece of property, and then trying to make money from it! I knew there was something basic and straightforward about this idea. It's like building tollways: they say they will go away when they have paid for themselves, but there is always maintenance. And, it's run by a semi-private toll authority, using third party private processors to collect toll "violations." So, if the taxpayer votes for it through their local government, and if they money comes from the taxpayer, what does the taxpayer get? Nothing but higher prices all the way around. So, if I get nothing from it, and it's not mandatory for the "common good", i.e. utilities, defense, public health, why should the public pay for it? Bottom line: If the owner, the NFL, and local government want a new stadium, find a way between yourselves to finance it. After all, those are the parties who benefit from it. But leave the public out of it. We'll vote with our dollars when we show up for games and other events. Isn't it great to be rich and know the right people so you can find out ways to access all that free public money to make yourself even richer! God Bless America! Georgia Dome is only 20 years old...I know you need to plan ahead, but as far as statiums are concerned, its not that old. Maybe they should wait another 10 years or so before they start worrying about a new one. Plenty of other teams have old stadiums and they are doing fine. Example, Soldier Field was opened in 1924, Arrowhead Stadium, 1972, Lambeau Field, 1957. With these older stadiums still being used with no end in sight would a stadium that was opened in 1992 need to be replaced already?